Jonathan Bird’s Blue World is an educational family-oriented underwater adventure series hosted by dynamic naturalist and underwater photographer Jonathan Bird. 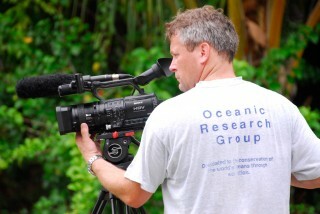 It is co-produced by Jonathan Bird Productions and the non-profit organization Oceanic Research Group. Each half-hour television episode consists of three separate segments running 5-11 minutes in length. For online viewing, each segment is a self-contained webisode. Segments encompass a variety of subjects, including stories about animals, marine research and researchers, underwater exploration and recent discoveries. The stories always have an underwater theme and feature stunning underwater photography. The programs are suitable for younger viewers, but please do not consider it only a children’s program. Viewers from 6 to 60 enjoy this series! If you are curious about the development of Jonathan Bird’s Blue World, read about the history of the program. For stock footage inquires, please see our Blue World Stock Footage Collection. Jonathan Bird's Blue World has received many awards and honors, including eight New England Emmy Awards, four consecutive National Daytime Emmy Nominations (2013-2016), the CINE Golden Eagle, National Educational Association endorsement, National Science Teachers Association endorsement, honorable mention for cinematography at the International Wildlife Film Festival, Honorable Mention at the Blue Ocean Film Festival, featured selection at the Chicago International Children's Film Festival and inclusion in the "Top 10 Web Shows to Watch During the Writers Strike" by PCMag.com. Oceanic Research Group, Inc. is a 501(c)3 non-profit environmental organization dedicated to the conservation of the world's oceans and marine life through education. O.R.G has produced more than a dozen educational films about ocean topics for use in schools and maintains an educational website that is used in thousands of classrooms around the world. O.R.G. is a principal partner in the production of Jonathan Bird's Blue World. Jonathan Bird Productions is Jonathan's television production company which has produced films that have aired all over the world in more than 20 countries on networks such as Discovery Channel, National Geographic Channel, Discovery Channel UK, Discovery Channel Canada, Discovery Channel Germany, La Cinquieme (France), ABC, PBS and even the SciFi Channel.